Leaders at East Lindsey District Council have said that ‘doing nothing’ is not an option as they approved a £300,000 spend to investigate how to make the authority more sustainable, including a potential head office move. Council leader Craig Leyland and portfolio holder Richard Fry asked for the cash at a meeting of the authority’s executive on Wednesday night. Council leaders hope that by modifying the way the council runs to be more ‘ambitious’ and commercial with its assets it can generate further revenue and make the authority more sustainable and able to reinvest in services. He said ELDC had a ‘huge financial challenge’, particularly beyond 2020. “We need to have the capacity to make money from our assets and invest,” he added. • The potential of setting up the council’s own housing company, similar to North Kesteven District Council’s Lafford Homes. This could see ELDC develop homes and create an income from rents. • Looking at whether ELDC can use its own land to build its required number of affordable housing by using contributions from developers. • Looking at the council’s use of office space, how it uses its current facilities at Tedder Hall, in Manby and Skegness Town Hall, and the feasibility, including whether the council could move home. 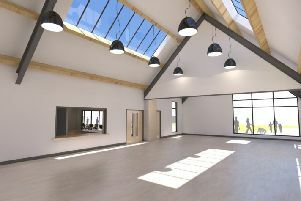 • Working with Magna Vitae to improve leisure services, including the redevelopment of the Station Sports Centre in Mablethorpe. Councillor Fry said the aim was to increase the income for MV in order to reduce costs for ELDC. • Improving the council’s renewable energy scheme including providing solar panels and electric car charging points. East Lindsey District Council has seen funding cuts of £7million since 2010 – around 30 per cent – and will need to find a further £3.7 million by 2021.